Hello brilliant people of frictional forums! I hope you can help me with a little (OK OK BIG) problem I've been having. It's a bit hard for me to include very much information because this happened a long time ago but I'll do my best. Previously the editors just crashed when I tried to open them. If I remember correctly this has been the case ever since the model viewer crashed as I was loading a model, but not sure about that bit. After that I thought maybe I just needed to update my OS, after that I've been getting the error in the above picture. Everything still works on my windows. I've tried reinstalling hpl2 and amnesia multiple times, I also tried deleting the hpl2 bit in the application support and reinstalling but no luck. I figure it either one of two things. A: This would be sad, but is HPL2 just not set up for the new OS? This is on version 10.9.5. If this is the case is there anyway to run HPL2 on the new OS without having to buy Windows to run in wine or boot camp or w/e? B: Something, somewhere is corrupted and I just haven't deleted/reinstalled it yet. Thanks to anyone that tries to help! RE: Help! HPL2 crashes on mac! 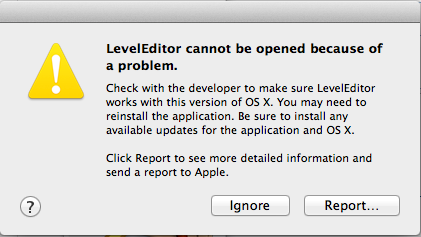 Yeah, this is a common problem, and has been ever since Mavericks was released. HPL2 does not really work properly on anything above 10.8. Maybe this will be fixed soon, but I wouldn't put my hopes up. I reverted the update and have been using 10.8.5 ever since I found out 10.9 wasn't working with it. (12-10-2014, 09:22 PM)Mudbill Wrote: Yeah, this is a common problem, and has been ever since Mavericks was released. HPL2 does not really work properly on anything above 10.8. Maybe this will be fixed soon, but I wouldn't put my hopes up. I reverted the update and have been using 10.8.5 ever since I found out 10.9 wasn't working with it. I wasn't aware you could revert after you updated mac OS's. Maybe I'll try that then. It's not a simple process. You'll have to completely format your hard drive, meaning all files will be lost unless you back them up. Took me 2 days to get back in business. Do you think it's possible that 1.3 will fix this problem when it comes out for mac? It might. That's what I'm hoping for. I'm pretty sure FG is aware of this issue, but I don't know if they're aware of a solution.